Saw the following mentioned on the local news here in Cincinnati. Kitchen 1883 is a new restaurant concept by Kroger and is Now Hiring for Multiple Positions in Union, KY!! Kitchen 1883 is a new and exciting restaurant opening in Union, KY. This fresh new take on American comfort food will feature a made from scratch menu, hand crafted cocktails with a family friendly atmosphere. If you are ready to welcome guests into our kitchen where the ambience is built around community, have an outstanding customer service and a passion for exceptional service, then we want you to apply. Let's see if this turns out to be an Applebee's/O'Charley's/T.G.I. Friday's knockoff or something worth eating at, and if it expands nationwide eventually. Freestanding? Or connected to the grocery store? Because our Fred Meyers (Kroger owned) stores are expanding the in store eat/sit down cafes. Yes, here in Dallas Central Market (HEB), Market Street, and Whole Foods all offer areas where one can consume their prepared foods on premises. Kroger has several 100,000+ sq. ft "Marketplace" stores that even sell furniture & appliances! They are immense, but they really don't offer any more selection; the reviews are 'meh'. Went once myself. That was enough. The existing Kroger Marketplace locations in the area have a cafe area with hot food from the deli, sushi and salad bar and a Starbucks. This looks to be different as it will have its own separate entrance and signage (which does NOT mention Kroger). It's in a new shopping center where Kroger is the main tenant, so I'm not sure if it's a part of the store or is in one of the outbuildings. Note that the job postings listed for Kitchen 1883 include bussers, servers, hostesses and bartenders. Definitely not the staff you see in the in-store cafe. The Kroger I shop at has a small "eat-in" restaurant. I love their fried chicken. Delicious large pieces for only .99 each. A little more information and a laughably bad conceptual drawing. 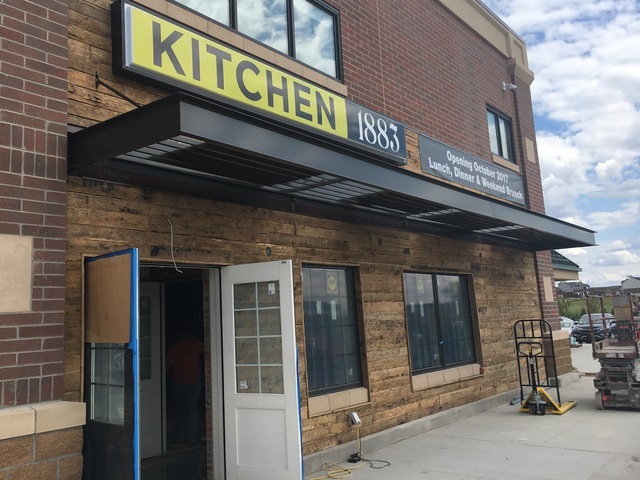 CINCINNATI, Sept. 14, 2017 /PRNewswire/ -- The Kroger Co.'s (NYSE: KR) Culinary Development team today announced a new restaurant concept, Kitchen 1883, which offers a fresh take on new American comfort food. Kitchen 1883's "New American Comfort" menu is a melting pot of American and international flavors. Located at 9003 U.S. Highway 42 in Union, KY, the restaurant will operate daily offering lunch and dinner along with brunch on Saturdays and Sundays. The restaurant is scheduled to open in late October. Are they intentionally trying to make it look like a family restaurant from the 70s? The concept 'booths' are hysterical. maybe they were thinking of the Seinfeld episode where Kramer finds the Merv Griffin Show set in a dumpster when they designed it. I had a very good chicken fried steak at Market Street in McKinney. Very surprised after I was disappointed because that's where we were going for dinner. Ended up there again for breakfast the next morning. That was a few years ago and if I knew it was just as good, I'd go back. Wegmans is doing the same thing here near Syracuse NY. Website has been updated with restaurant hours, lunch, dinner and brunch menus. Well that's a new one on me. Wonder what my late father would say. I remember when they opened a Krogers on Nacogdoches Road in San Antonio. My dad mentioned to th ecashier about picketing Krogers. I asked daddy, "What are you talking about?" He then explained it was back in Milwaukee before WW2. Grandpa was president of the meat cutters union up there and there was a labor dispute between the company and the union. Grandpa tried hard to work something out with them, but Kroger wouldn't budge. So grandpa called a strike, and daddy said he and my Uncle Tom got paid to picket the stores.